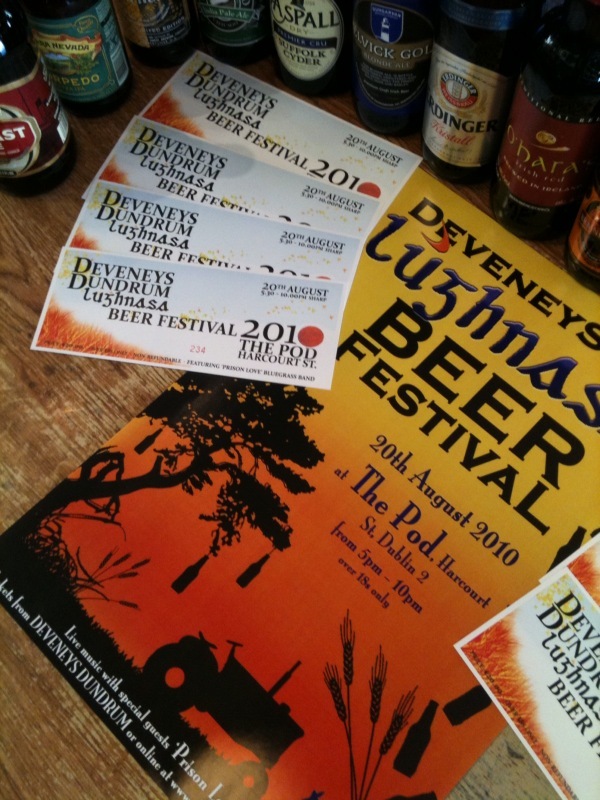 Deveneys of Dundrum: Lughnasa Beer Festival tickets for sale. Lughnasa Beer Festival tickets for sale. After much design debate we have agreed, sent to print and as of yesterday tickets and posters are here in my possession. I can guarantee that you will come across these colourful posters in the strangest of locations. Unfortunately the tickets must be purchased through Deveney's of Dundrum or via Paypal on this blog. Look forward to vending to you all!!! Labels: Lughnasa Beer Festival tickets for sale. What does the ticket price entitle you to? The Ticket price of €20 entitles the ticket holder access to the Beer festival, 5 complimentary Beer Punts, the festival Beer book and your tasting glass. Looks like a good night out. Just wondering is there a rough guide to the pricing of drinks when we get there? 1 'Beer Punt'= 1 beer measure (140ml), additional 'Beer Punts' are available to purchase through the 'Beer Bank'for €1.50 each. It's an inexpensive way to taste as many unusual beers as you like and it's really good fun! Are there still a few tickets available? There are tickets available but the sooner you get in the better, advertising on radio and papers to start within the next 3 weeks. Don't want any disappointment, there will be no ticket sales on the night, if I can help it!! !It'll be a great night. Stupid price. Its not 2006 you know.